Mirabeau Lamar monument at Stephen F. Austin State University in Nacogdoches, Texas, reads: "The cultivated mind is the guardian genius of democracy." Lamar grew up at Fairfield, his father's plantation near Milledgeville, Georgia. As a child, he loved to read and educated himself through books. Although he was accepted to Princeton University, Lamar chose not to attend. He started work as a merchant and then ran a newspaper, but both of those enterprises failed. In 1828, Lamar's family connections helped him to gain a position as the private secretary to Georgia Governor George M. Troup. In this position, Lamar issued press releases and toured the state giving speeches on behalf of the governor. On one of his trips, he met Tabitha Burwell Jordan, whom he married in 1826. When Troup lost his reelection bid in 1828, Lamar established a newspaper in Columbus, Georgia, the Columbus Enquirer. This venture was much more successful than his previous business attempts. In 1830 his wife Tabitha died of tuberculosis. Lamar was deeply affected and took time to recover his drive. He withdrew his name from consideration for re-election to the Georgia Senate, in which he had served one term. Lamar began to study law. He was admitted to the bar in 1833 and ran an unsuccessful campaign for a seat in the U.S. Congress. Lamar's brother Lucius committed suicide in 1834. A grief-stricken Lamar began traveling to escape his memories. In the summer of 1835, he reached Texas, then part of Mexico. He decided to stay, where he was visiting his friend James Fannin. He had recently settled there and was working as a slave trader in Velasco. After a trip back to Georgia to sell property, Lamar returned to Texas. Learning of a battle for independence, he traveled with his horse and sword to join Sam Houston's army in spring 1836, and distinguished himself with bravery at the Battle of San Jacinto. On the eve of the battle, Lamar courageously rescued two surrounded Texans, an act that drew a salute from the Mexican lines. One of those rescued was Thomas Jefferson Rusk, later appointed as Texas Secretary of War. Lamar was promoted that night from private to Colonel and given command of the cavalry during the battle the following day. Houston noted in his battle report: "Our cavalry, sixty-one in number, commanded by Mirabeau B. Lamar, (whose gallant and daring conduct on the previous day, had attracted the admiration of his comrades and called him to that station,) placed on our right, completed our line..." Lamar was appointed as the Secretary of War in the interim Texian government. In 1836, he was elected as vice-president of the Republic of Texas under Houston. 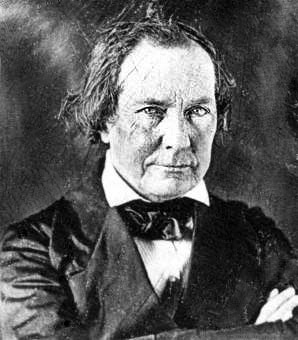 Lamar, the unanimous choice as nominee of the Democratic Party for president to succeed Houston, was elected, and inaugurated on December 1, 1838. Houston talked for three hours in his farewell address, "which so unnerved Lamar that he was unable to read his inaugural speech." It was given by his aide, Algernon P. Thompson. Lamar's vice president was David G. Burnett. Several weeks later, in his first formal address to the Texas Congress, Lamar urged that the Cherokee and Comanche tribes be driven from their lands in Texas, even if the tribes had to be destroyed. He proposed to create a national bank and to secure a loan from either the United States or Europe. Finally, he stated his opposition to potential annexation to the United States and wanted to gain recognition of the Republic of Texas by European nations. He ordered attacks against the Indian tribes. In 1839 Texan troops drove the Cherokee tribes from the state. Houston's friend, Chief Bowles, was killed in battle, leaving Houston angry at Lamar. The government conducted a similar campaign against the Comanche. Although losing many lives, the Comanche resisted leaving the area. Lamar believed the “total extinction" of the Indian tribes was necessary to make the lands available to whites. He drove the Indians out at the Battle of the Neches, where 500 Texans attacked 800 American Indians of several different tribes. What should be noted, is that out of the 800 Indians, between 400-500 of them were women, children, and elders. The Texans and Rangers that attacked the tribes were fully armed, while the Indians had just 16-24 rifles and pistols. Before the attack, Duwali, Gatunwali, Big Mush and other chiefs and leaders asked for time to gather their crops, then they would go in peace, but Lamar would not wait. Lamar ordered the Secretary of War, Albert Sydney Johnson, and General Thomas J. Rusk to run them out of Texas. Some say he stated: "Just kill them all." Lamar appointed a commission to select a permanent site for the capital of the Republic. After two months of debate, they recommended the small town of Waterloo, along the Colorado River toward the center of the state. The town was renamed Austin after the pioneer, and by October 1839, all of the records and employees were relocated there from Houston. That same year, Lamar founded the Texas State Library (presently known as the Texas State Library and Archives Commission). During his administration, Lamar sent three separate agents to Mexico to negotiate a peace settlement. All failed. Lamar succeeded in gaining official recognition for the Republic from Great Britain, France, and Belgium. He did not succeed in getting loans approved from them. To fill the treasury, he authorized issuance of a large amount of Republic of Texas paper money, known as Redbacks. The paper money was virtually worthless. Spending doubled during Lamar's term and, combined with the worthless currency, caused financial difficulties for the government. Lamar believed that the Rio Grande was the western boundary of Texas. He wanted to send an expedition to New Mexico to establish trade, and convince the residents, still under Mexican rule, to join the Republic. The Texas Congress refused to fund the expedition in 1839 and 1840. In June 1841, Lamar took $89,000 from the treasury and sent an expedition on his own initiative, a move of dubious, at best, constitutionality. Its members were arrested when they reached Santa Fe, and told they would soon be released. Instead, under guard, they were marched to prison in Mexico City, and many died during the journey. Lamar has been called "the Father of Texas Education" because of his provisions of land to support it. During his administration, he convinced the legislature to set aside three leagues of land in each county to be devoted to school development. He also allotted 50 leagues of land for the support of two universities, later developed as Texas A&M University (1876), under the Morrill Act, and the University of Texas (1883). Although no facilities were constructed during his term, he provided the base for a statewide public school system. As Texas was a slave-holding society, even the few free blacks did not have access to public education. A public school system was not firmly established until after the American Civil War, when the Reconstruction era legislature created an endowment to finance a school system. In 1869, it passed a law to give the public school fund the proceeds from sale of public lands. The constitution of that year authorized the legislature to establish school districts and appoint directors. Freedmen's children were included in the system, despite much opposition. Houston was elected again as president after Lamar. The latter returned to service in the army, and distinguished himself in the U.S. Army at the Battle of Monterrey during the Mexican-American War. During this period of time, money was tight in Texas; Lamar borrowed money from his banker cousin Gazaway Bugg Lamar. Some of the letters on this subject between the two are amusing. In late 1847, he was assigned as a post commander at Laredo, but disliked the job as he wanted more action. Lamar was elected from Eagle Pass in the Texas Legislature for several years after Texas was annexed to the United States in 1845. In 1857, President James Buchanan appointed Lamar as the Minister to Nicaragua, and a few months later to Costa Rica. He served in Managua for twenty months before returning to Texas in October 1859 because of poor health. He died of a heart attack at his Richmond plantation on December 19, 1859. Lamar's volume of collected poems, Verse Memorials, was published in 1857 (New York, W.P. Fetridge & Co., 224 pages). Mirabeau Lamar monument at the Fort Bend County Courthouse in Richmond, Texas. Lamar County, in northeast Texas, and Lamar, a small unincorporated community in Aransas County on the Texas Gulf Coast, are named for him. Lamar Boulevard, a major thoroughfare in Austin, and Lamar Blvd., a major street in Downtown Houston, also carry his name, as do other streets in many older communities across Texas. Mirabeau B. Lamar is the namesake of Lamar, Missouri. Lamar University in Beaumont was named for him in 1932. It is the largest educational facility to be named for the former Texas President, and has an enrollment of over 14,000 students. The campus features a commemorative bust of Lamar. The defunct Lamar University System named all of its member institutions after him; these included Lamar State College - Port Arthur in Port Arthur, Lamar State College in Orange, and Lamar Institute of Technology in Beaumont. High schools are named for Lamar in Houston, Arlington, and Rosenberg. Middle schools are named for Lamar in Temple, Austin, Dallas, Irving, and Flower Mound. Elementary schools are named for Lamar in Amarillo, Corpus Christi, El Paso, San Antonio, and The Woodlands; as are numerous other K-12 schools throughout the state. A fictional Lamar Military Academy is featured in Preston Jones' play The Oldest Living Graduate, which is part of his A Texas Trilogy. ↑ 2.0 2.1 2.2 2.3 2.4 2.5 2.6 Hendrickson (1995), p. 35. ↑ 6.0 6.1 6.2 6.3 6.4 6.5 Hendrickson (1995), p. 37. ↑ 8.0 8.1 8.2 Hendrickson (1995), p. 38. ↑ 11.0 11.1 Hendrickson (1995), p. 39. ↑ Eaton, David Wolfe (1916). How Missouri Counties, Towns and Streams Were Named. The State Historical Society of Missouri. pp. 207. https://books.google.com/books?id=RfAuAAAAYAAJ&pg=PA207#v=onepage&q&f=false. Ramsay, Jack C. (1984). "Thunder Beyond the Brazos: Mirabeau B. Lamar, a Biography". Eakin Press. ISBN 978-0-89015-462-5. Siegel, Stanley (1977). "The Poet President of Texas: The Life of Mirabeau B. Lamar, President of the Republic of Texas". Jenkins Pub Co. ISBN 978-0-8363-0153-3. Sketch of Mirabeau Lamar from A pictorial history of Texas, from the earliest visits of European adventurers, to A.D. 1879, hosted by the Portal to Texas History.